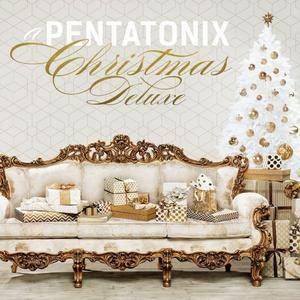 A Pentatonix Christmas is the fifth studio album by American a cappella group Pentatonix. It is also their second full-length holiday album since That's Christmas to Me in 2014. Featuring two new original songs, "Good to Be Bad" and "The Christmas Sing-Along", A Pentatonix Christmas debuted on the Billboard 200 at number three with 52,000 albums sold in its first week, and later peaked at number one, selling 206,000 units in its best week. A Pentatonix Christmas marks as their second number one album on the Billboard 200 after Pentatonix. The album also debuted atop the Billboard Holiday Albums chart, their second number one on that chart after That's Christmas to Me. As of January 2017, 904,000 units of A Pentatonix Christmas have been sold in the US and 1,400,000 units worldwide. A deluxe edition is set to be released on October 20, 2017, almost a year after the original's release. 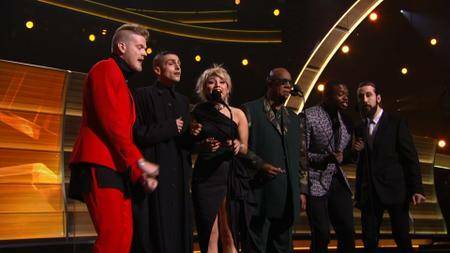 Stevie Wonder & a cappella group Pentatonix perform tribute to Maurice White at the 58th Grammy Awards, February 15, 2016. 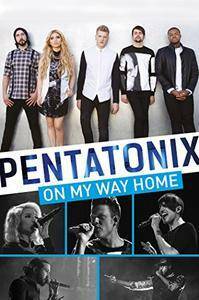 Pentatonix is the fourth studio album by American a cappella group Pentatonix, which was released on October 16, 2015. This is the first release of the band to feature predominantly original material (the only covers being the cover of Shai's "If I Ever Fall in Love" and the bonus tracks on the deluxe version of the album). Pentatonix also marks the first time band members receive individual songwriting credits for the majority of the tracks. Pentatonix debuted atop the US Billboard 200 chart with 98,000 album-equivalent units, with the album being their first No. 1 album on the chart. Since bursting onto the scene in 2011, Platinum selling recording artists Pentatonix have won multiple Grammy Awards, sold out venues worldwide, have amassed over 1.6 billion views on their YouTube channel with over 10.9 million subscribers and appeared in the feature film Pitch Perfect 2. The group will release their third Holiday album "A Pentatonix Christmas" on October 21, 2016. The album will be a mix of covers and original tracks, including a cover of "Hallelujah" with an accompanying video to be released in line with the album release. 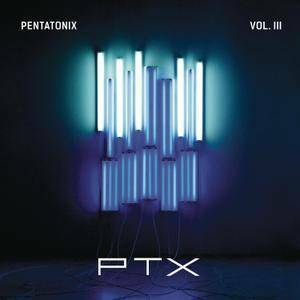 A cappella ensemble Pentatonix's fourth studio EP, 2014's PTX, Vol. 3 features more of the group's forward-thinking, genre-bending vocal music. This is the group's third mini-album since winning NBC's The Sing-Off in 2011. As with 2013's PTX, Vol. 2, here we get a mix of modern pop covers and original songs, all done in the group's trademark combination of EDM, R&B, and traditional vocal group styles. Included are the songs "Problem" and "La La Latch." 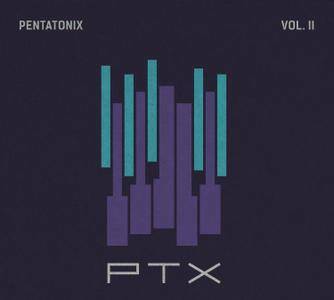 Released in 2013, PTX, Vol. 2 is the third EP from the Arlington, Texas-based a cappella ensemble Pentatonix, who won season three of NBC's The Sing-Off vocal competition. 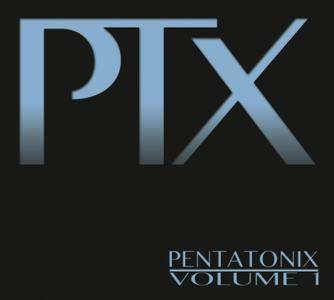 As the follow-up to the group's 2012 EP PTX, Vol. 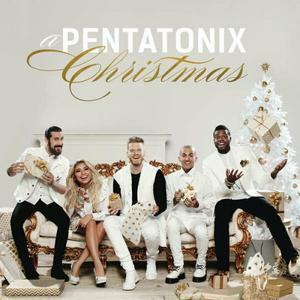 1 and holiday-themed PTXmas, PTX, Vol. 2 features more of the band's a cappella versions of contemporary pop hits. Included are such covers as Macklemore & Ryan Lewis' "Can't Hold Us," Calvin Harris and Ellie Goulding's "I Need Your Love," and even a Daft Punk medley that combines the songs "Harder, Better, Faster, Stronger," "Digital Love," "One More Time," and "Get Lucky." Also included are several of the band's unique original songs, including "Natural Disaster, "Love Again," and "Run to You." 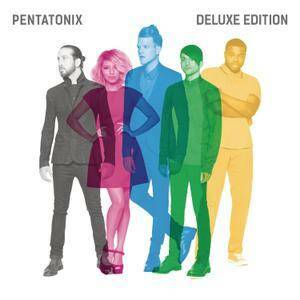 The 2012 debut EP from the five-member vocal ensemble Pentatonix, PTX, Vol. 1 features a cappella versions of contemporary pop hits. Included are the band's takes on Nicki Minaj's "Starships," Jazmine Sullivan's "Love You Long Time," Gotye's "Somebody That I Used to Know," and others. Also featured here are the two original songs, "The Baddest Girl" and "Show You How to Love." PTX, Vol. 1 is a great introduction to the Arlington, Texas-based group, which previously won season three of NBC's The Sing-Off vocal competition in 2011. 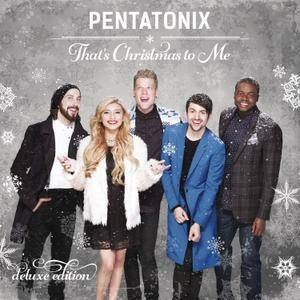 "That's Christmas to Me" is the third studio album by a cappella group Pentatonix. It is their sixth release overall and their second holiday release following their 2012 EP PTXmas. It only features previously unreleased material. The album is also the highest charting holiday album by a group since 1962.